Dealers for Blackjack are always in demand. It may seem that the question how to become a Blackjack dealer at any well known casino is too complicated, but in fact it`s not. All you need to know is the professional skills used in becoming a professional Blackjack dealer. Blackjack dealing skills are taught in various schools all over the world, as a matter of fact the training can be done over the internet as well. Blackjack dealers are not highly paid; they get paid in the rage of a school teacher. However, Blackjack dealers do receive great bonuses and some heavy tips for the good job they have done. Players if not more also receive great bonuses and online casino offers that cannot be refused and are warmly accepted. The truth is if a player has won a large amount of money during the Blackjack game at a casino, it is very common, if not anticipated, to give a large casino tip to the dealer. One should know the pros and cons of the game to become a Blackjack dealer, which means one should look at the cards and immediately understand the sum. This skill can only be mastered by simply dealing and playing the game. Playing this game at home with friends and family members will help you learn this skill very quickly. Managing cards professionally means not even by mistake, should a card accidentally turn over while dealing. This won't occur if it`s handled properly. Anyway, it is no so hard to become a dealer and casino dealer jobs may give a lot of benefits. It is very important to manage the money, chips and bets, the dealer should be capable of counting the amount and each chip quickly and accurately. The customers may uproar and you could also lose your job if you are careless while handling the money and chips. The Blackjack dealer should have adequate experience in chip handling to make sure this never happens. Casinos use automatic card shuffling machines to ensure tow things 1) the player cannot blame the casino or the dealer of non-random shuffling 2) the dealer cannot stack the deck. The Blackjack dealer should have adequate experience in using the automated card shuffling machine. To treat customer in proper way is the most important skill, the Blackjack dealer should be always courteous and smiling to everyone at the table, managers, passers-by - everyone. A Blackjack dealer should remain clam at all times. Being courteous is not a job requirement, this also benefits the Blackjack dealer. You should know the locals, the most frequent customers. Players who come to the casino regularly are the ones who play frequently and win large sums on occasion. Establishing a friendly relationship with these customers will be worth the time, since these customers are the best tippers. You should be ready to stand for long hours, if you want to be a Blackjack dealer. Normally a Blackjack dealer stands in the same position for almost 40 minutes with a 20 minute break, the cycle continued till the shift lasts. In this job the Blackjack dealer will be constantly moving his arms, and will be bending at the waste and elbows. 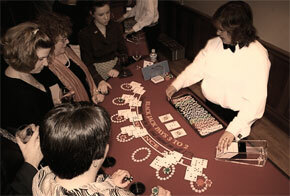 People with joint pain, back problems and arthritis, have no chance in serving the Blackjack industry.